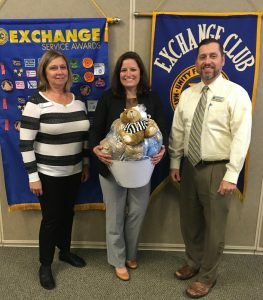 The Exchange Club of Richmond Hill recently hosted Bryan Co. Juvenile Court Judge Christy Balbo. Judge Balbo spoke on the issue of child abuse and neglect in Bryan County, and also regarding the CASA Program (Court-Appointed Special Advocacy). The club presented Judge Balbo with several “Time-Out-Teddies”, which are used with abused and neglected children. Child abuse and neglect is a problem that knows no socio-economic, geographic, or racial boundaries. It can be found in all segments of our community, and is something that everyone should be aware of. Pictured at (left to right) Janet Thayer (Club President), Judge Balbo and Chet Gregg (Club Vice President).